Lutron RadioRa is Lutron’s partial or whole home solution for lighting controls. This system is versatile, expandable, operates from a multitude of controls including IPhone and IPad. It can be retrofitted into an existing residence, giving it the widest potential of applications. The concept of the RadioRa product series is dimmers, switches, lamp controls and more that operate lighting in a traditional dimmer manner. In addition, the RadioRa product series accepts radio signals from a main processor and repeaters, allow instant communication of these devices with the RadioRa software. The standard limitation of this system is 100 devices, though there are scenarios where this can be taken to 200 products. The key to RadioRa is the wireless component, which allows the system to be integrated into a room or central control without requiring changes in the existing residence wiring and does not cause any need for sheetrock repair or damage to existing control locations. 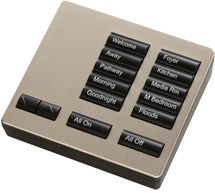 The system has many features including the ability to program lights that will automatically turn on at preset times, to know when daylight savings time changes, to know sunset and sunrise each day of the year, to control Lutron wireless shading systems, to control lamp controls and so much more. All these features allow the user to automate their home lighting and shading to the greatest extent possible. The only limitation to RadioRa is cost which can grow to a significant amount based on the total number of components needed. In addition, RadioRa does require a Lutron certified installer/programmer. More information can be gathered at Lutron or contact lightinggourmet@passionlighting.com to get further information.